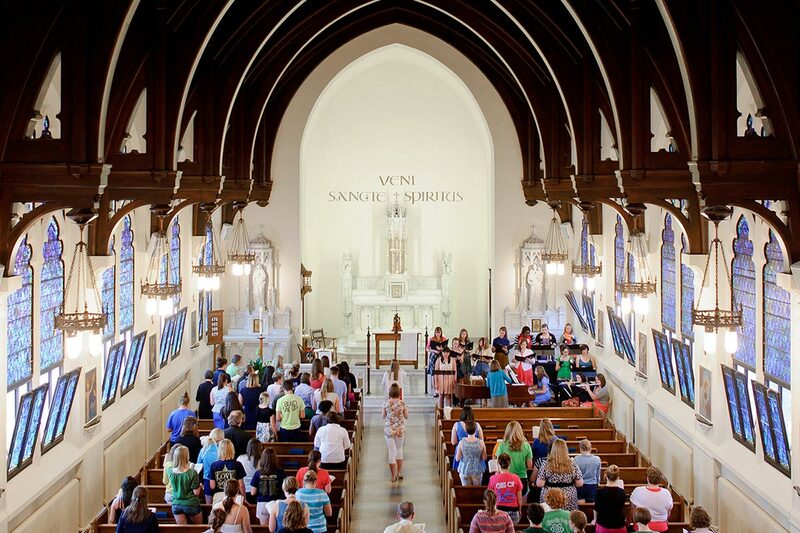 You’ll feel and see the presence of Holy Cross religious at Saint Mary’s and the adjacent campuses of the University of Notre Dame and Holy Cross College. The sisters’ international novitiate and motherhouse is nestled here behind Holy Cross Hall. The U.S. province for the priests and brothers is on the Holy Cross campus and Moreau Seminary is just north of the university. We have sisters who are professors in political science, English, and nursing, and several serve on our Board of Trustees. If you take classes at Notre Dame and Holy Cross, you’ll notice priests and brothers serve at both as faculty and administrators. The impact of the Holy Cross religious on the local community is immeasurable. Their presence is woven into the fabric of South Bend’s history. The Congregations of the Holy Cross, which include sisters, priests, and brothers, have been a part of the South Bend area well before the city was incorporated in 1865. In 1841 Blessed Anthony Moreau, founder of the congregations, sent Father Edward Sorin and six brothers to the northern Indiana wilderness, where, in 1842, they founded the University of Notre Dame. In 1843, Moreau dispatched four sisters to assist them. Within two years, the sisters founded Saint Mary’s. Much later, in 1966, the brothers founded their own school here, Holy Cross College. Sisters, priests, and brothers have served the spiritual, educational, and health care needs of the region since they arrived in what was remote wilderness more than 170 years ago. Students from all three campuses volunteer in the community’s schools and countless nonprofits, as they have for decades. The Congregation of the Sisters of the Holy Cross is richly diverse in age, culture, and ministry. With the convent on campus, Belles create strong bonds with sisters. The popular Friends with Sisters program pairs students with retired sisters. Some courses offer experiential learning opportunities where students interview them about their lives of service in education, healthcare, and other ministries. Some nursing and education students serve with sisters in Uganda at a school and health clinic in the summer.